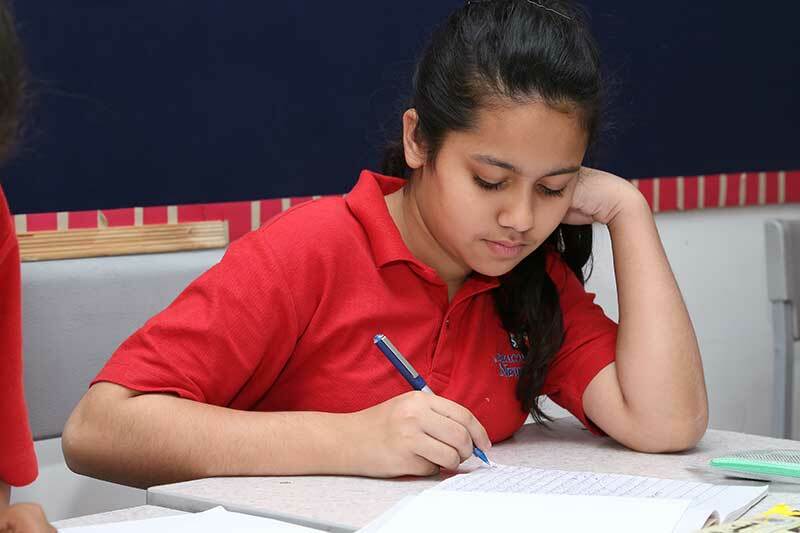 The curriculum offered from class VI to VIII at Newlands Middle School is designed keeping in view the Cambridge International Examinations (CIE) expectations. We aim to promote best practice for curriculum delivery and assessment to improve the educational outcomes for all students. We want our students to graduate with 21st century skills in order to succeed in work and life. Our vision is to develop strategic learners who are prepared for varied and unpredictable career paths in a global digitized world. Our purpose is to develop lifelong learners who can problem solve, think creatively and critically, communicate effectively and act ethically. The Middle School curriculum enables teaching and learning to take place in a rich framework. The core emphasis is on a broad and balanced curriculum across a wide range of subjects honing creative thinking, inquiry and problem solving skills through a structured programme to develop practical skills and provide conceptual understanding. The learner-centered approach and a positive classroom environment encourage every child to develop not only academically, but socially and creatively in well-woven ways. 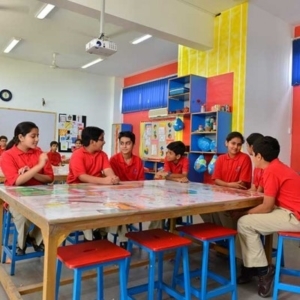 Effective technology integration, active learning techniques, discussion sessions, guided research enables our students to grasp underlying concepts with ease and encourages them to take ownership of their learning. Our carefully designed language curriculum along with other subjects of study polishes students further, as fully aware individuals, who participate actively to make their learning a meaningful experience. In our Personal Social Health Economic (PSHE) programme, students get a chance to discover the different sides of their own personalities and learn strategies to overcome veiled flaws. Additional support classes offered after school have been valuable in curbing the tuition culture, as students get ready assistance in case they are struggling with concepts. Students and staff are committed to developing the school as a community of stakeholders with a shared responsibility of creating optimal conditions for sustained, relevant and rigorous learning in order to be successful global and digital citizens. We are committed to embracing the cross curriculum priorities and the general capabilities of the CIE Curriculum. In a technology-rich environment, where every classroom is equipped with multimedia projectors and netbooks are available for all our students, learning is both enjoyable and personalized. 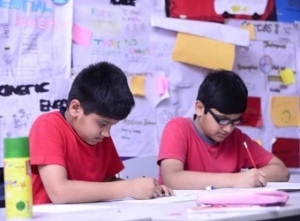 Our co-curricular programme offers a unique gamut of skill- based clubs and a well thought-out-sports suite, which not only enriches the curriculum but also provides experiences necessary for students of this age group. We welcome you to become a part of an invigorating learning experience that equips learners to be responsible and empowered individuals and helps them optimise their potential.